Though it would’ve been seen by far fewer people, an actual documentary might’ve better served the legacy of World War II code-cracker Alan Turing. Director Morten Tyldum’s biopic The Imitation Game tells a compelling story, but it crumbles under even moderate scrutiny of facts versus Graham Moore’s screenplay. 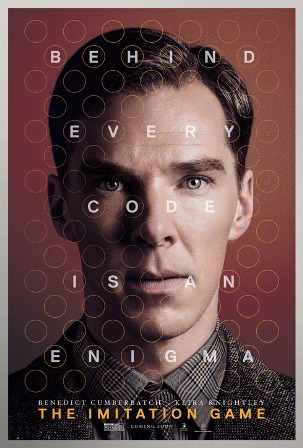 Turing (Benedict Cumberbatch) is depicted as the principal designer of a machine utilized by British intelligence to decrypt the German military’s Enigma. Though Enigma it considered virtually unbreakable, British Commander Alastair Denniston (Charles Dance) is nonetheless tasked with assembling a team of the nation’s top mathematical minds to attempt the seemingly impossible. The methods by which the British army deciphered the Nazi’s encoded messages, paving the way for the eventual Allied victory, makes for a riveting story. Even with fairly broad artistic liberties taken in order to streamline potentially confusing details, watching Turing assume leadership to single-mindedly pursue the mission objective is thrilling. 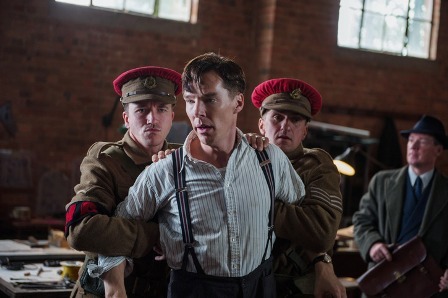 Cumberbatch expertly conveys the prickly, impersonal qualities that make Turing so disliked by his teammates, including hotshot Hugh Alexander (Matthew Goode). He’s a humorless, calculating outsider, but he slowly begins to achieve results – aided greatly by his risky (by that era’s sexist standards) recruitment of a female, Joan Clarke (Keira Knightley). Tyldum paints Turing’s team as a sort of prim-and-proper Mystery Inc. gang. There are even shades of an intellectual Revenge of the Nerds – a motley crew of endearing outcasts banding together to buck authority while on the way to win World War II. A more historically-accurate portrayal would’ve shown a far more expansive – and protocol-adhering – group of military professionals working behind the scenes. Narrowing the number of individuals involved was necessary in order to whittle a big story into a character-driven movie. But treating these brilliant minds as a rambunctious college fraternity was perhaps not the most effective approach. Furthering that character-based approach, Turing dubs his code-cracking creation “Christopher” after a childhood friend who never returned after a school holiday. It’s a dramatic device intended to display Turing’s singular devoted obsession and it almost works, if only for the excellent performance of Alex Lawther as the young Turing and Jack Bannon as Christopher. But it leads to some structural problems. 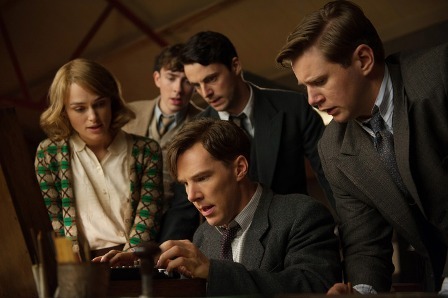 Gradually The Imitation Game emerges as two very different stories. Turing was gay, which was a crime in the U.K. at this point in history. His childhood with Christopher ties into his post-war adult life, during which he was charged with “indecency” based on his sexual orientation. Without delving into “spoilers” (though Turing’s conviction and sentencing is matter of public record), he faced severe and reprehensible penalties. The problem is Turing’s sexuality is essentially irrelevant to the story of MI6 cracking Enigma. Even with a fabricated subplot that suggests (rather disrespectfully) Turing was willing to compromise national security as a way to protect his personal secret, the two narrative threads do not weave together. Both are important stories (1. a gay man living a closeted life in fear of legal persecution in ‘40s and ‘50s-era Britain, 2. a race against the clock with Alan, Joan, Hugh, and company working feverishly to decrypt Nazi transmissions), but each could’ve supported its own movie. Joan Clarke’s struggles as a woman doing what was considered a male job could’ve been the focus, but it too would’ve been at odds with the WWII thriller approach that Tyldum has taken. The Imitation Game remains a worthwhile film, but a dose of history is required to untangle the embellishments from the official record.